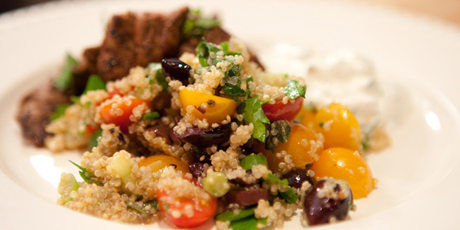 You might also like these Quick and Easy Quinoa Recipes. 1. Whisk together the lemon juice, vinegar, oregano, garlic and some salt and pepper in a small bowl. Slowly whisk in the oil until emulsified. Let sit at room temperature while you prepare the salad to allow the flavors to meld. 2. Rinse the quinoa in a strainer until the water runs clear. Combine the quinoa, 2 cups water, 1 teaspoon salt and 1/4 teaspoon pepper in a small saucepan, bring to a boil and cook until the water is absorbed and the quinoa is tender, about 15 minutes. 3. Transfer to a bowl, fluff with a fork and let sit for 5 minutes to cool slightly. Add the tomatoes, olives, green onions, cherry peppers, red onions, cucumbers and dressing and toss to coat. Cover and refrigerate for at least 1 hour and up to 8 hours before serving. The longer it sits the better the flavor. Courtesy of Bobby Flay from "Bobby Flay Fit". Copyright 2012 Television Food Network G.P. All Rights Reserved.